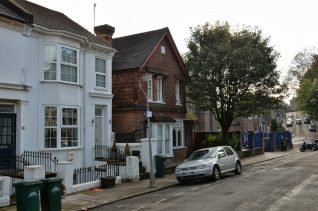 I lived at Robertson Road, in the late forties to early fifties.We lived next door to the dog’s home and my parents were friendly with the vet and his wife, a Mr and Mrs Gardener. I used to do a paper round for Mr Boswood across the road from me. I also in the mornings, used to fill an old barrow up with papers, and take them up to Preston Park Station to sell. We had a trestle table that was kept in a room up on the station and I used to set it up outside the entrance at the top of Clermont Road. The commuters used to come running up the road as the train was coming in and just throw their money on the table, grab a paper and not wait for their change, I made a lot of pocket money doing that. In the winter if we had any snow, we used take our sledges up to the top of The Drove, or ‘Black Hill’ as we called it, and come zooming down and under the arch in South Road. You certainly could not do it these days. I remember doing my mum’s shopping at White and Wilsons grocer’s shop and Terry Turnbull’s butcher’s shop. I also remember ‘Soft Water Laundries’; they had a chute for the baskets to slide down. Of course that was just too much temptation so we boys used to slide down there for fun. Did you live in Robertson Road? Do you remember the ‘dogs’ home’ now the PDSA? What other shops do you remember? If you can share your memories with us, please leave a comment below. I didnt live in Robertson Rd but I did live in Hampstead Rd up until the time I was about 15 years old, and I worked as a paperboy at Boswoods Newsagents opposite the dogs home on the corner of Black Hill. At that time the shop was owned by old Mr Boswood but run by his son Dave and wife Betty. God how the time has flown, I am now 74. As an addition to my previous post, at the top of Robertson Road was a very small general store run by a Mrs Smith and I think on the corner of Scarborough Road was a greengrocer. Yes, great memories. I did a paper round too for Boswoods – up Millers Road – Tivoli Crescent – can’t remember all the roads – across Dyke Road into Hove. What else? 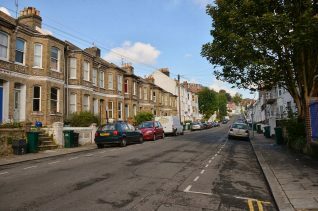 We lived in Scarborough Road, my mum did her grocery shopping at White and Wilson across the road from us. There was a general shop called Balls – which us lads made dirty remarks about!. A man who did haircutting from his front room at a house just above Boswoods. A butcher on the corner of Kingsley Road – and of course the laundry – can’t remember the name. I left to join the RAF in 1951- as a pilot, much to the surprise of my pals. I’m working on a Hampstead Road house history and would love to hear from anyone who can remember living in or near this road in the early to mid 20th century. I lived in Scarborough Road from 1930 to 1950. I did a paper round for old Mr Boswood. I have fond memories of my time during those years. Many years ago I interviewed an elderly gentleman who worked most of his life for White & Wilson, which was a very superior grocers. His name was ‘Mr Port’ and however much I tried to obtain his first name for the references I would need, he refused to give it! After a very long, and not easy, interview I left and returned home and played the tape back (it was that long ago!). The tape was concealed within the cover and then I realised the recorder had not been turned on correctly! I was too cowardly to contact him for a second interview! However I do remember that he delivered groceries in a small van in the 1950s to the then new housing around Queen Victoria Avenue and Woodland Drive. My grandmother lived at 19, Kingsley Road back in the ’40s to ’80s. I’m trying to remember a little boy I used to play with who lived opposite further down road. He apparently died and his father was David an actor. I was never told he’d died when he was young; I am now 50. I remember a boy in the 70s, father called David an actor. Lived in Kingsley Road?